Congratulations on your new puppy! You’re in luck, because learning how to train your dog from scratch is much easier than trying to get them to unlearn bad habits. Puppies are obsessed with getting your attention, and are very eager to please. This makes it the ideal time to begin puppy leash training when they’re young. As with every other type of training, leash training a puppy takes consistency and patience. It’s a little difficult at first, but keep at it and you’ll have a perfectly behaved pup padding along on a slack leash at your side during every walk. 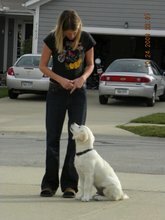 Start off by understanding the psychology of how to train your dog. All animals in nature work off of reward systems. If they behave in a certain way that brings about a desired result, their brains will give them a massive jolt of pleasure. Keeping that in mind, you have to remember to never reward your puppy for an undesirable behavior. In this case you must avoid rewarding your puppy for pulling against the leash. It will cause the both of you discomfort and will set you back a good deal in leash training a puppy. So before taking your puppy on its first walk, get it used to the leash by letting the pup wear it around the house. They’ll drag it around, chew on it, and generally act cute but eventually the walking implement will be forgotten. Once they’ve achieved a level of comfort with the leash, take up your end and walk around the house with them. Figuring out how to train your dog is about getting them used to being right by your side with a lot of slack on the leash. Doing this in a controlled environment free of all the distractions in the outside world will do wonders for their self-control. 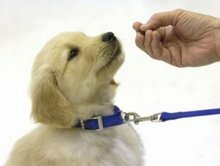 While you’re performing the puppy leash training exercises, it’s important to reward your puppy for the proper behavior. Keep a package of their favorite treats on you, and reward them every time they find themselves in the correct position. However, if their tendency is to pull away and keep the leash taut you’ll have to do the most frustrating thing imaginable for both of you. This is where your patience is key. Puppy leash training will drive you to your wits end if you have a particularly stubborn pup, and the first few sessions are going to be tasking no matter what. Still the best way to break them of bad leash training habits is to let their undesirable behavior go unrewarded. They have to realize that whenever they pull in the wrong direction, they won’t go anywhere. So when a puppy begins pulling, stop in your tracks and call them back. Once they return to your side reward them with plenty of praise and a tasty treat. Repeat this process until your brain is numb and you’ll have a perfectly leash trained puppy. It sounds like you're being very patient, which is fantastic so don't let that time invested go to waste. It's easy to stay focussed for so long and then let that built up frustration go. With a puppy that doesn't walk, it's important never to pull, you'll find they rear up and the leash then starts to become a negative. Try playing some games in your yard with the leash on such as tug-o-war just to get her up and moving. This wouldn't normally be advised since play time on the leash can be a pain when you are out and about. We just want to get her up, moving and happy to generate some positive reinforcement, don't continue this or you will have a misbehaving puppy. Move immediately to the treats and make sure you only do this inside your yard until your puppy gets used to the leash and walking next to you following. Steadily move closer to the gate, then open it but stay inside, then move outside and back in etc. This can take 20 go's or more. Never do this training with any distractions. Oh one more, try sitting down at the full leash length without tension and calling her to you with treats, it will also get her moving. get to the point where you can be standing and then moving back as she approaches you. Good luck and let me know how you go.